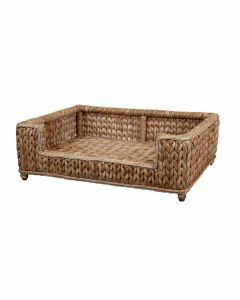 The casual appeal of rattan is the best match for a classic dog bed. These beds are made by some of the world’s most accomplished weavers. This set includes three dog beds. Large bed measures 28’’ x 23.5’’ x 9’’, medium bed measures 25’’ x 20’’ x 7’’, and small bed measures 22’’ x 17’’ x 6’’. The beds come with the cushions, as shown in the picture. Please note this bed is for interior use only. It is recommended to clean with a lightly damp cloth and dry immediately after. Avoid using harsh chemicals. Click image for greater details.